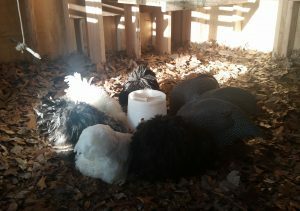 Chickens & Guinea Hens: These birds live in a Chicken Castle (large coop) and roam the property during the days we are open. They generally do not want to be picked up, but many children follow them around and enjoy watching them (and chasing them). 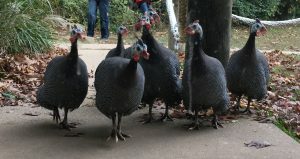 Guinea Hens peeking in the office. The birds were originally brought here because they are voracious eaters of ticks, and we did not like the idea of treating the entire property with chemicals several times each year for environmental reasons. We bring in new baby chicks each year during the months of April, May, and June, and this is a great time to be able to pick them up (gently) before they are large enough to join the adult flock in mid-summer. Children may hold the chicks with an adult or staff member present. 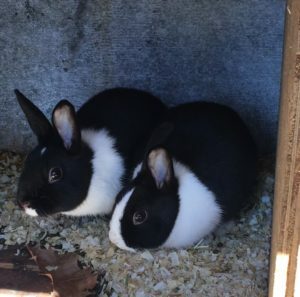 Bunnies: Our bunnies have a two-level pen with a retractable roof. Adult or staff members can pick up and hold the bunnies for children to pet, but hold carefully as they may jump down and run into the thickets where she will be difficult to catch, and this might result in her being eaten by a predator. Please ask if assistance is needed, as they can decide to kick or scratch in an effort to get away. Children love to bring weeds & grass to the rabbit - they eat anything green but prefer dandelions, wildflowers, broadleaf weeds, and leftover raw vegetables and apple cores. Nigerian Dwarf Goats: Nigerian Dwarf goats are known for their even tempers and gentle playfulness making them wonderful pets for children. Always a good idea to have 2, everybody needs a friend. They’ve been used in nursing homes and hospitals as service animals. Who doesn’t love a furry friend? They may be small in size however, require room to play and explore. They love their toys…tree stumps & climbing structures so we’ve created just that. Goats can be taught their name and to come when called. Stay tuned, we’ll see how this works out. Their pupils (like many hooved animals) are rectangular. This gives them a vision for 320 to 340 degrees compared to humans with around 160 to 210 degrees. They have great night vision. What? Goats are great BURPERS! Oh my. We hope they use their manners. Be sure to stop by and say “hi”. 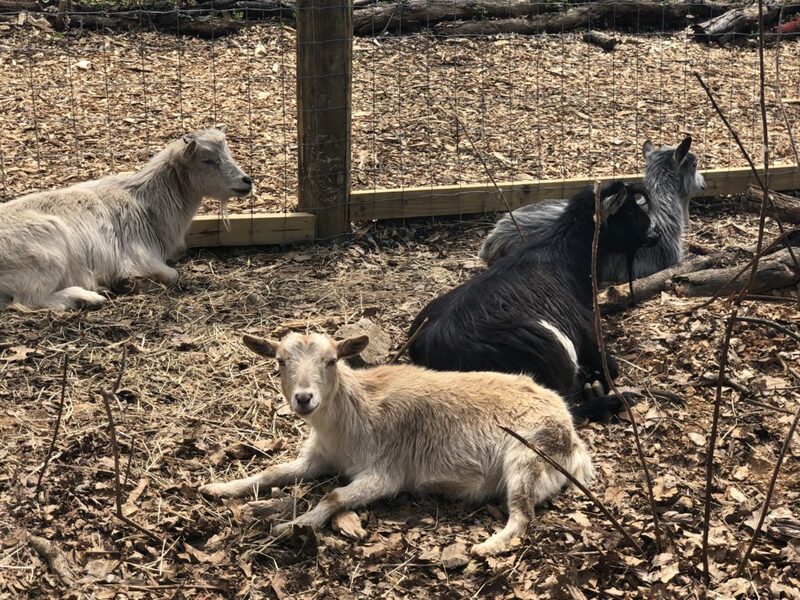 Our four Goats relaxing in the sun.